October 6, Monday, had been declared as a regular holiday by Pres. Benigno Simeon Aquino III in observance to Eidul Adha or Eid al Adha (Feast of Sacrifice), one of the the most important feast in Islam that is celebrated worldwide. 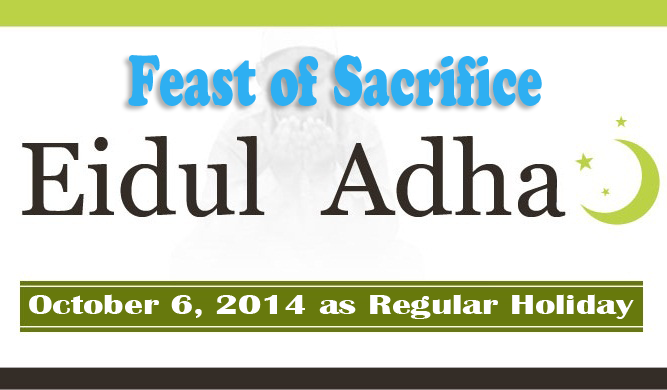 As stated in Proclamation 785, The National Commission on Muslim Filipinos (NCMF) had recommended the observance of Eidul Adha to be on Octoder 6. The proclamation had dated September 12 and had been announced to school and teachers last week but had only been released to the media on Monday, Sepetember 16. Republic act 9849 provides that the said Muslim feast should be celebrated as a regular holiday as Malacanang cited in Proclamation 785. The feast is to celebrate the willingness of Ibrahim, known to Christianity as Abraham, to sacrifice his son Ishmael as commanded by Allah thus the name “Feasts of Sacrifice”. The day of the feast is based on the declaration of Saudi Arabia’s highest religious body and also marks the end of Hajj, the holy pilgrimage of the Muslims to the Mecca of the Holy City.